To any sensible person that has bothered to study a little modern world history, socialism in the sense of the Marxist philosophy, was a great idea but not a practical one. In the UK, especially in the 1970’s, we had a half-hearted quasi-socialism which was the worst of all possible worlds. There was industrial action on a grand scale with wildcat strikes, flying pickets, energy blackouts, dead bodies literally piled up on the streets and no sensible Briton would want to return to that sorry state of affairs. And of course no one has suggested that we might do; no one that is except the right-wing media including the Daily Mail, Daily Telegraph and the BBC’s Sunday and Daily Politics! Does anyone at the Daily Mail own a dictionary? This week Ed Miliband seems to have rattled a few right-wing media cages with his statement that the Labour party is a “Democratic Socialist” party. Of course the media, and former Sunday Times editor Andrew Neil in particular, decided to focus solely on the word “socialist” and then to view the entire week’s proceedings at the Labour party conference through that red tinted prism. 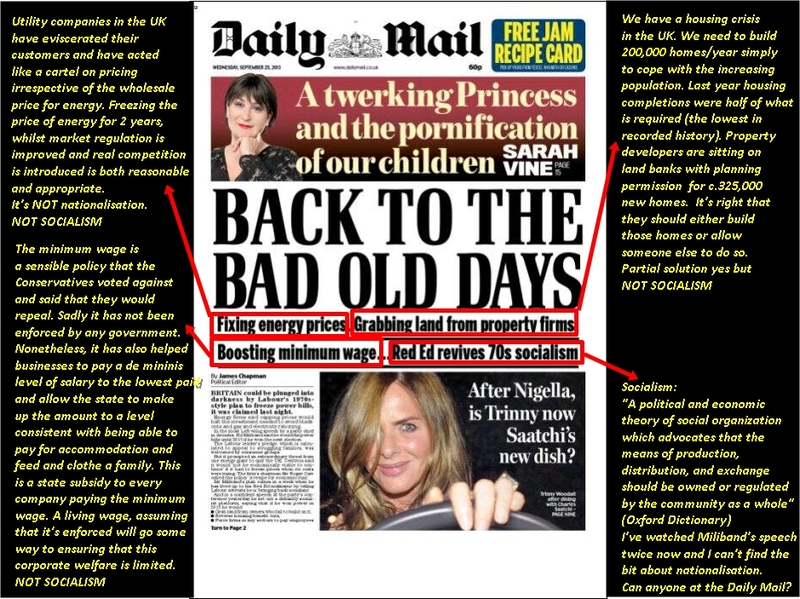 Thus every day this week The Sunday and then the Daily Politics have shouted the word socialist from the rafters and it has been clear that they had an agenda. Several times, starting with Rachel Reeves on Sunday, Andrew Neil & Co have asked various conference attendees if they or their party are “socialist”? But when the answer has come back “Yes, democratic socialist” Neil and his associates have appeared to ignore the answer and claim that, if the speaker was a member of the shadow cabinet, they were resisting mentioning the word. Andrew Neil and the rest of the right-wing media should familiarise themselves with some basic economics texts. Successful implementation of free market economics relies on a multiplicity of competing businesses to be successful and to generate the best outcome for society as a whole. Where a few companies dominate a market prices are higher, innovation is lower and, as we have seen, to our great cost, the excessive economic power of the dominant companies translates into cronyism and undue political influence. Hence we have regulatory regimes that entrench the position of the dominant corporations, tax regimes that allow them to pay no or little tax, poverty wages and politicians that take the corporate pound in return for legislating to support, or even improve, the companies market position. If a party proposes to restrict the dominance of global companies and promote smaller businesses, that is NOT socialism, that’s capitalism being made to work in the interest of the many and not the few. It is the best way yet conceived to resolve both the massive wealth inequality and lack of social mobility that we are faced with today.